Ligia Dennis, 26, and fiancé Tim Ballany hold a giant check for $1.3 million (left). Dennis' winning lotto scratcher (right). LOS ANGELES -- A 26-year-old hairdresser from Los Angeles nearly gave away her winning $1.3 million lottery ticket to a homeless man. 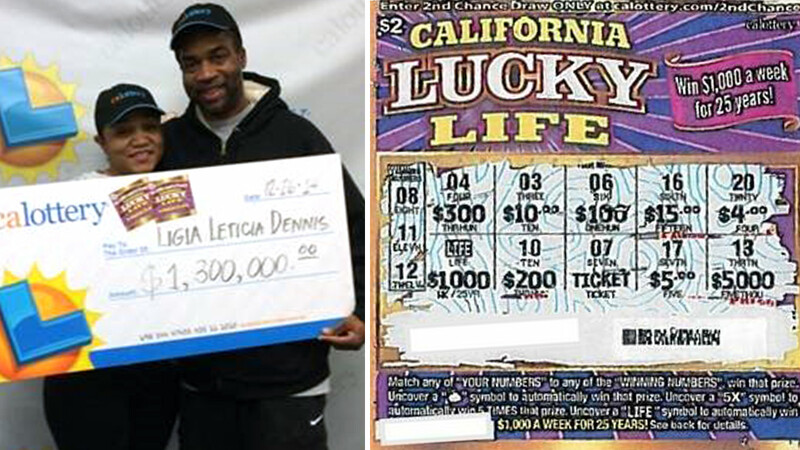 On Dec. 16, while waiting for her clothes at a Laundromat, Ligia Dennis decided to walk across the street to Big Jim's Donuts in East Hollywood to buy a coffee and three California Lucky Life Scratchers tickets. She gave away two tickets to her brother and mother. Dennis' fiance Tim Ballany said a homeless man asked for her change and she nearly gave away her last ticket, but decided against it. When she went to cash the lottery ticket in, Dennis thought she won $1,000. That's when a Van Nuys Lottery employee broke the news. She had actually won $1,000 per week for 25 years, totaling $1.3 million. "I'm shocked. I can't believe it," said Dennis, who hopes to pay off her student loans, other bills and open up her own salon. "It's always been my passion. I've been a hairdresser for about six years. It's always been my dream to own my own salon," she added. She plans to consult a financial advisor before deciding whether to take the entire $1.3 million over 25 years or the $750,000 lump sum before federal taxes.